For the one-woman climate conference Cry me a river, Austrian actress Anna Mendelssohn collected dozens of lectures, debates, interviews and conferences about climate change. 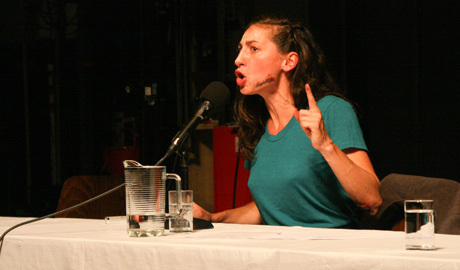 With that material, she created one monologue that does not ignore the subject’s complexities. Where do facts turn into gut feeling? How do you seperate politics and personal life? While speakers succeed each other and emotions flare (sincere or not), a procession emerges, consisting of scientists, personally involved people, consultants and charlatans, all claiming to carry the truth.